Hachi Parmentier is truly one of my favorite dish in the world as it brings back many fun childhood memories, but eating such meals everyday would increase my waist line:-). So while my family was enjoying their Hachi Parmentier, I ate a meal that was much kinder to my waistline: Tilapia with Kumquats. Ingredients for one single serving: 1 tilapia filet of about 6oz. , 5 Kumquats, butter, 1 mandarin, salt and white pepper to taste, Brocoli Slaw, and one lemon. Sprinkle salt and white pepper on either side of the filet. Drizzle lemon juice on the filet and leave it alone until you are preparing the Kumquats. Slice each Kumquat in tiny slices. Remove the seeds. Melt 1 Tb of butter in a pan, saute the Kumquat slices until they become translucent. Remove the Kumquad from the pan, saute your filet in the remaining butter, sprinkle the filet with the juice of the mandarin that you will squeeze over the pan. Cook the fish 2 minutes on each side until it becomes white and flaky but still moist. While the fish is cooking, or before, prepare your vegetables. In this recipe, I did very simple. I used broccoli slaw. I diced 1 Kumquat very very thinly, mixed it in the broccoli slaw. I placed the broccoli slaw mixture in a microwavable dish, sprinkled salt, pepper and added 1 Tb of mandarin juice. I covered the dish with cellophane and cooked the broccoli slaw in the microwave for 2 minutes. To serve, place the broccoli slaw on the plate, place the filet on top of the slaw. 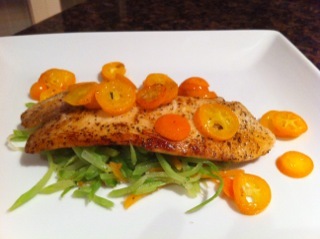 Spread the Kumquats on the fish, drizzle the juice from the pan on the fish. If you like more sauce, you can also make a beurre blanc, melt 2 Tb of butter with the juice of a mandarin and drizzle over the fish.